Hanging planters aren't just for flowers anymore. Conjure up a picture of container gardening and you'll probably imagine rows of plant pots ranged neatly on a porch or patio. Although this is a solid base for a container garden, savvy gardeners know you can grow more plants if you use all three dimensions in a gardening space. Hanging pots have been around for a long time, but newer upside-down planters can handle larger plants in the same amount of space. Innovative upside-down planters have been popular for almost a decade, and the first commercially manufactured one was marketed as a tomato-growing tool. Gardeners using such pots choose one that can hold from one to five gallons of soil and hang them in a sunny spot. They put a tomato plant in a hole in the bottom of the container. The plant grows downward and outward, creating a bushy hanging plant that produces tomatoes in about the same amount of time as traditional methods. Gardeners pour water into the top of the container, and it trickles down through the potting soil to moisten roots while the plant grows. 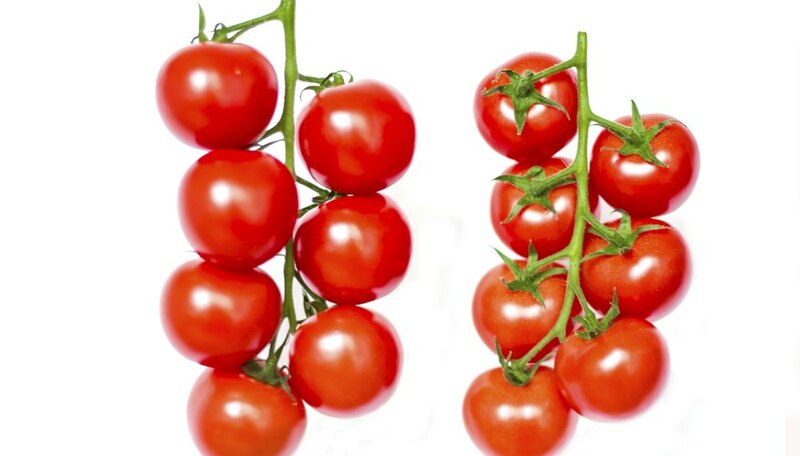 Because of the great weight of the plants and the tomatoes, the most successful varieties in upside-down planters are cherry-type tomatoes such as Supersweet 100 or Patio Princess Hybrid. If you prefer a larger tomato, avoid the large beefsteak varieties and go for more compact examples. Tomatoes grown upside down have many of the same needs as those grown in ordinary garden plots. These vegetables need lots of sunlight, so hang the planter in a sunny spot, and turn it each day so different parts of the plant receive sunlight. Tomatoes prefer rich soil with lots of organic matter. In an upside-down planter, potting soil is the dirt of choice as it's formulated not to compact down during the growing season. Use one plant per container to allow each vine to grow to its full potential. Tomatoes require a constant source of moisture, which may mean watering every day with an upside-down planter. Water in some 5-10-5 fertilizer when the tiny tomatoes form and once again after you begin to harvest to help production. Commercial planters exist, but you can do just as well with homemade versions. For tiny cherry tomato plants, choose a 1-gallon bucket. (Full-sized plants need a 5-gallon bucket.) A hole about 2 inches across in the bottom of the bucket provides access for the plant. Filling the bucket with soil and watering it gives the soil a chance to become uniformly moist. When planting, newspaper wrapped around the root ball keeps the seedling in the hole and the planting mix in the bucket. Once the bucket is planted, it should be hung immediately and watered again thoroughly. Add soil periodically if it comes out of the bucket. Paint dark-colored buckets white. Dark buckets will absorb too much heat, cooking fragile growing roots. Use the top of the soil to grow other plants such as marigolds, leaf lettuce or small herbs. Make a habit of turning the planter every time you water. As with any tomato plant, upside-down tomatoes will continue to produce through the growing season if you pick ripe fruit regularly. What Vegetables Can You Grow Upside Down?